NEW YORK — Aung Zaw, the founding editor of The Irrawaddy Magazine, received the International Press Freedom Award, which was presented by the Committee to Protect Journalists (CPJ) in New York on Tuesday night. He is one of four international journalists who are honored this year for promoting press freedom in their countries; the other CPJ awardees come from news organizations in Russia, South Africa and Iran. The award is an annual recognition of courageous reporting and acknowledges the work of journalists who have faced imprisonment, violence and censorship while carrying out their work. 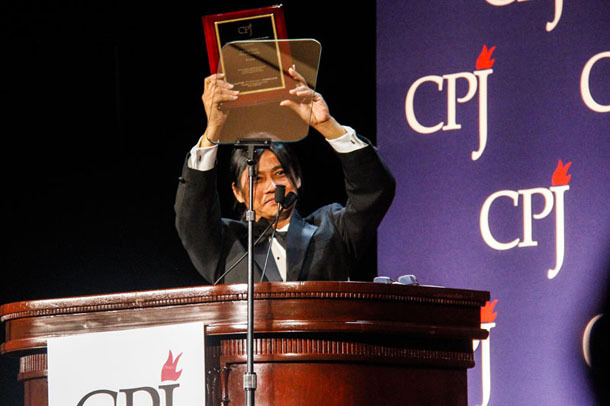 This year, Vietnamese blogger Nguyen Van Hai, who was imprisoned when he won the CPJ award in 2013, was also there to attend the gala held at the Waldorf-Astoria Hotel and receive his award. 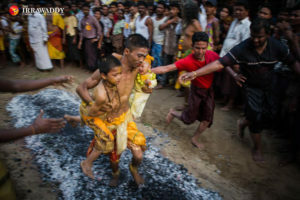 Rebecca MacKinnon, a CPJ board member who presented Aung Zaw with the award, said his work was being honored because of the strength of two decades of The Irrawaddy’s reporting on Burma in the face of risks to him and his team. 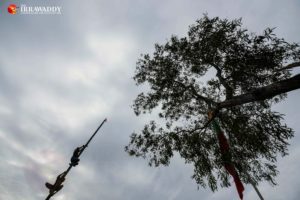 [irrawaddy_gallery] MacKinnon noted that Aung Zaw was branded an “enemy of the state” by the former military regime, while his publication remains under pressure from Burma’s current, nominally-civilian government. 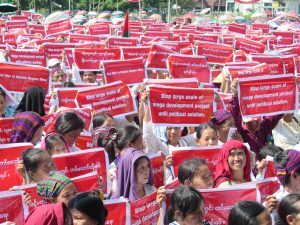 In his video message broadcast at the event, CPJ Senior Southeast Asia Representative Shawn W. Crispin said: “Aung Zaw is perhaps one of the most eloquent, powerful voices of press freedom in Burma. 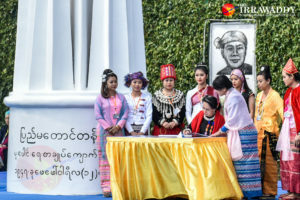 He founded what originally was a newsletter that evolved into a full-fledged news organization that is perhaps the most independent, critical view of Burma.” In his acceptance speech, Aung Zaw touched on the current situation in Burma and warned that recently there has been “serious back sliding” during the democratic transition. 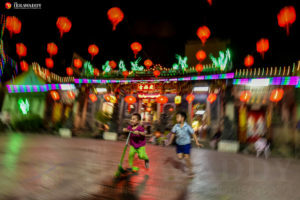 He questioned the very nature of the reform process and whether it is a real break from the past, or just a repackaging of the old political structures. “In the media sector, reporters are facing increased scrutiny, arrests, intimidation, detention and even death. 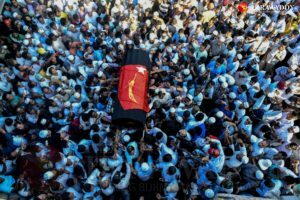 In October, an activist reporter was killed in military custody,” he said, referring to the extrajudicial killing of Aung Kyaw Naing by government soldiers in southeastern Burma. 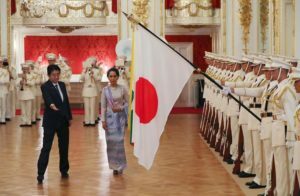 He also expressed his views on Western countries’ optimism about Burma’s reform and referred to US President Obama’s remarks in his recent visit to Burma, when the president said, ‘‘the reforms are real.” “I have to respectfully say that many Burmese people are not at all convinced of that. Sometimes, we worry that our international friends tend to airbrush some of the realities we live with. “I must tell you that this award means a lot to my dedicated team and Burmese journalists who defend press freedom in my country. 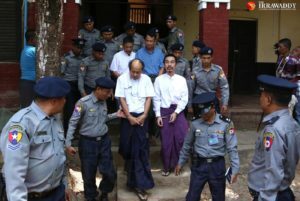 It is a sign that we are not alone and that the world is still watching what is happening in Burma,” he said. 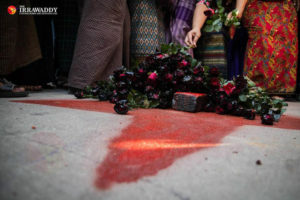 In March of this year, Aung Zaw was also honored with the 2013 Shorenstein Journalism Award from Stanford University’s Walter H. Shorenstein Asia-Pacific Research Center. In 2010, he received the Netherlands-based Prince Claus Award for Journalism. In 1988, Aung Zaw was a student activist who joined the democratic uprising in Rangoon. 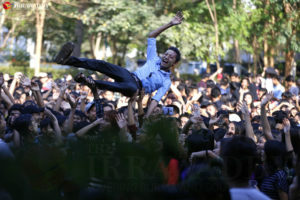 He was arrested on the Rangoon University campus during one of the student rallies and detained for a week. 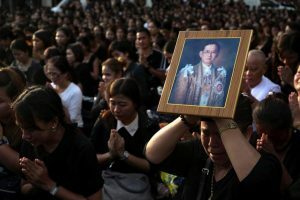 Shortly afterward, he fled to Thailand where he launched The Irrawaddy Magazine in 1993 to cover developments in his native country as it was sinking into international isolation and political repression. 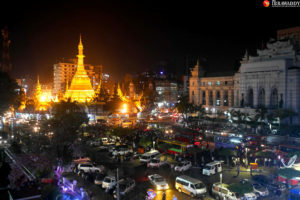 Today, The Irrawaddy reports from an office in Rangoon, Burma’s commercial capital, and has an English- and Burmese-language daily news website and two print publications: a monthly magazine in English and a Burmese-language weekly journal.